Japan’s love affair with Jamaican music continues. 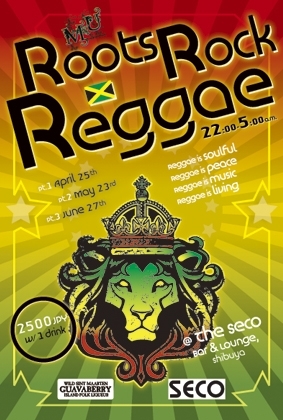 Shibuya’s Seco Bar and Lounge is set to be transformed into a Caribbean themed party complete with Jamaican food like jerk chicken and patties on April 25th, May 23rd and June 27th. Poster, full details and directions below. I wonder if any of my readers from or in Japan could attend this event and shoot me back some pictures? Hey definately come and check out Roots Rock Reggae. It is done by me a Jamaican who owns an entertainment company in Tokyo. next event in japan in……. please ! thank you, sorry my english is very poor ! I’m a brazilian girl ! I was a guest selector at the April event. Its a nice space, food was good but it was really a dancehall event. I come on about 3AM and when I dropped some roots records the dancefloor cleared out.